Browse: Home / Resources / Analysis Archives Old / LITTLE BOBBY HUTTON, PRESENTE! Today, April 6, marks the 44th anniversary of the death of Little Bobby Hutton. As the first recruit into the Black Panther Party for Self Defense, Bobby Hutton helped grow the newly-formed organization, participating in some the Party’s first education and service programs and serving as the Party’s treasurer, while upholding the traditions within the Black community of armed self defense against police violence. On the night of April 6th, 1968, just two days after the assassination of Martin Luther King in Memphis, Bobby Hutton was involved in a shoot-out with Oakland police. 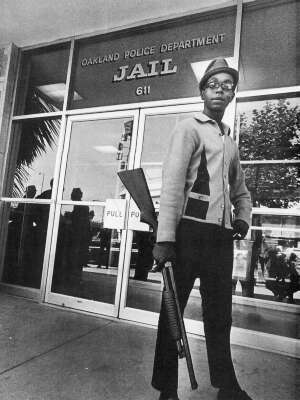 Upon surrender, Little Bobby Hutton was murdered by the OPD. He was 18 years old. The conflict leading to his death would be only one of many armed confrontations between police and the Black Panther Party, and marked one of the first deaths suffered by the BPP at the hands of the police. By 1971 at least 28 other Panthers would be killed by police throughout the US as part of the federal government’s war of repression against the Black Panther Party and other liberation struggles being waged across the country. 44 years after Bobby Hutton’s death, we still find our communities under attack by the violence of policing and the racist social and economic inequities this violence upholds. At the same time we see a continuation of US government’s counter intelligence programs (COINTELPRO) in the surveillance, infiltration, and disruption of social movements and targeted communities. But even as the oppression and repression continues, we see the living history of the work of those such as Bobby Hutton. All over the world the politics of the Black Panther Party burn brightly and serve as an inspiration for those struggling toward a new and better world. In memory of Little Bobby Hutton, and all the freedom fighters throughout the world whose bravery, love of their people, and unconquerable imagination continue to inspire us and push us forward.